It started out as a way to get hubby back up on that horse that bucked him off (metaphorically speaking). Unfortunately, even after these past few weeks of physical therapy he still isn't strong enough to follow through on what he originally set out to do. But he's still calling it his Redemption Tour. Then it became about our daughter who turns 25 in a little over a week from now. Big, grown birthday girl, another semester of college and another year of work (and another raise) under her belt. Then her boyfriend asked us if he could marry her. Although there is no engagement yet, it became a family thing that included the boyfriend. Probably a last chance to do it all together before an engagement, a marriage, and a baby or two. There is a reason I bought a scooter called Travelscoot. And that reason begins today. Stay tuned to see what all the fuss is about. 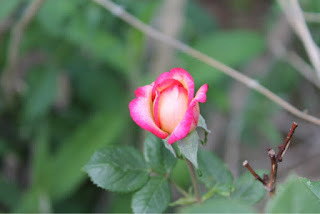 Before it starts, a picture of one of our miniature roses ready to bloom.